In Slovenia, the level of intensification in agriculture is low, focusing mostly on improving labour intensity in agricultural production, i.e. reducing the input of labour per unit of area or product. 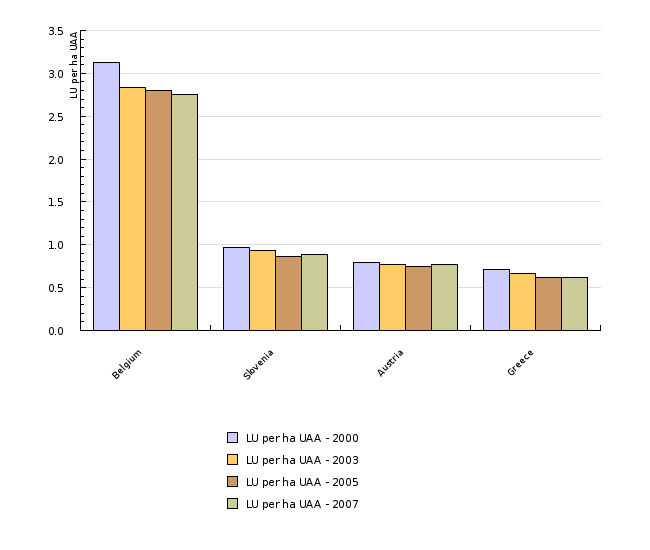 The number of livestock units (LU) per ha of utilised agricultural area as the most aggregate indicator of production intensity is stable; in the 1997-2003 period, the stocking density even decreased slightly. In labour-intensive types of farming (dairying), the intensity, which is measured by the average milk yield, is moderately increasing, and in labour-extensive types of farming (production of wheat or maize), the intensity has been at the same average level for a long time. Intensification of agriculture is a process which decreases production costs per unit of agricultural product. Production costs are the function of the cost of labour, the land and capital. Capital-intensive agriculture develops where availability of labour and, most of all, land, is limited (Belgium, the Netherlands). Countries with limited capital and land have developed labour-intensive agriculture (India, China), while countries with limited capital and labour have developed agriculture that requires extensive land (Argentina). Each of these three forms of intensification has different impacts on the environment, nature and social structure of rural areas. 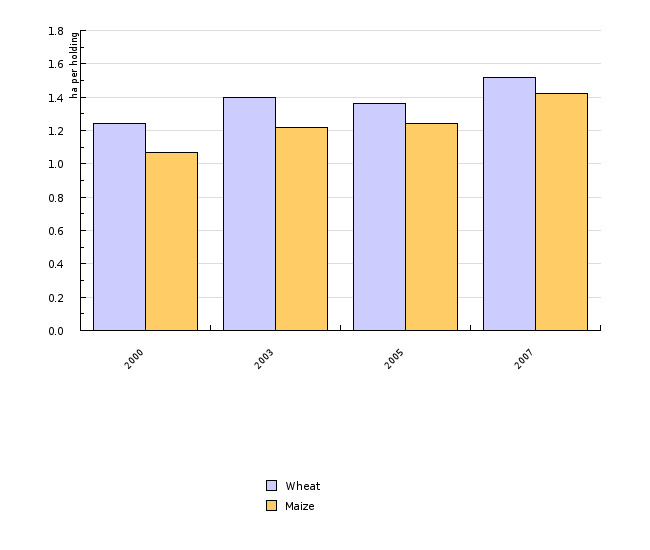 - milk or wheat and grain maize production trends per hectare. The indicator is defined and calculated in order to complement the indicator of specialisation and diversification in agriculture. We were unable to present the structure and development trends of holdings and their areas by cost types due to deficient and inadequate data on direct costs (for fertilizers, protection products) for individual production types (FADN accountancy data). Statistical Office of the Republic of Slovenia, 2002, 2008; Eurostat, 2008. Past experiences show that the intensification of agriculture in uncontrolled conditions is a process which can present one of the most extensive burdens on nature and the environment. These facts have made it one of the focal themes in strategic and programme documents of the European agricultural and environmental policy. The Water and Nitrates directives are the key environmental instruments limiting the possible negative consequences of intensification in agriculture. Agri-environmental concepts also present an important element of the reform of the agricultural policy in 2003. The importance of the protection of the environment in agriculture is increasing by means of the so-called cross-compliance and introduction of other measures for the achievement of ecological standards. Farmers eligible for financial support have to observe the prescribed standards regulating the environment, safe food and well-being of animals. They must also maintain their agricultural land in compliance with good farming practice. The importance of environmental concepts and measures in the framework of the rural development policy is increasing as well. Slovenia, too, committed itself to observe these rules by planning the implementation of the agricultural policy reform. Almost 90 % of all agricultural holdings in Slovenia are engaged in various types of livestock breeding, 60 % of which are oriented into cattle breeding. The number of farmers engaged in cattle breeding decreased by almost 10 % in the 1997–2003 period alone. According to the latest data, an average Slovenian agricultural holding oriented into cattle breeding breeds almost 7 livestock size units, which is almost 5 % more than at the beginning of the studied period. 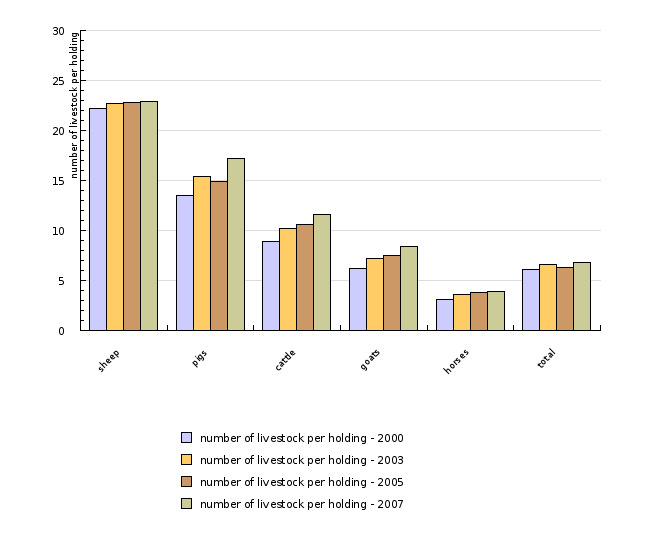 Structural changes in the so-called stocking density (the number of livestock units per hectare of utilised agricultural area is one of the most aggregated indicators of the environmental burden) are very inexplicit due to highly dynamic changes in the total number of livestock size units, and even more so in the total utilised agricultural area. As in other EU countries, stocking density in Slovenia is decreasing; it was reduced by almost 10 % in the 1997-2003 period alone (on average, it dropped below 1 livestock unit per hectare of utilised agricultural area). The shown number of livestock units per hectare of utilised agricultural area at the municipality level indicates a relatively atypical and dispersed spatial distribution of areas with diverse stocking density. In spite of a rapid decrease in the number of holdings oriented into dairying, and a slightly less distinct decline in the number of dairy cows on these holdings, the total extent of the production is still on the increase, regardless of annual fluctuations. The reason for this is a notable increase in the concentration of dairying – in the 1997-2003 period, the average number of cows per holding more than doubled, and at the same time the intensity of dairying increased. 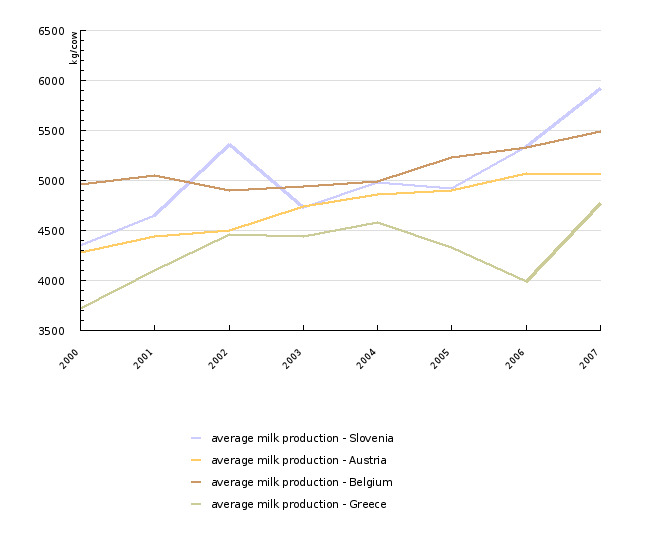 In six years, the average milk production per dairy cow (milk yield) increased by almost 1000 kg or by 25 %. With just above 4,700 kg per cow, Slovenia is still considerably below the EU-15 average, but still comparable with neighbouring Austria and some other EU member countries. Wheat and grain maize are the most important crops in Slovenia. In 2003, 25,460 agricultural holdings were engaged in the production of wheat, and 36,141 in the production of maize. Along with the decreasing number of holdings engaged in the production of these crops and the relatively unchanged extent of the total production, the concentration of the production is distinctly on the increase (average area of wheat and maize per holding). In Slovenia, the intensity of wheat production, measured by the amount of yield per hectare, is almost 1.4 tons lower than in EU in terms of the long-term average. 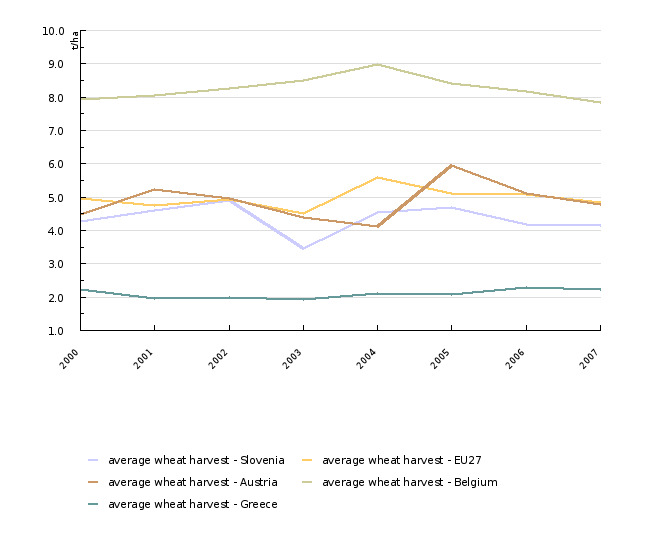 Hectare yield in Slovenia has not changed significantly for years. The situation in maize is similar, though the annual fluctuation is slightly more notable due to climatic factors. Statistical Office of the Republic of Slovenia, 2002. Dernulc, S., Iljaš, U., Kutin, B., Orešnik, I., Cunder, T., Golež, M., Juvančič. 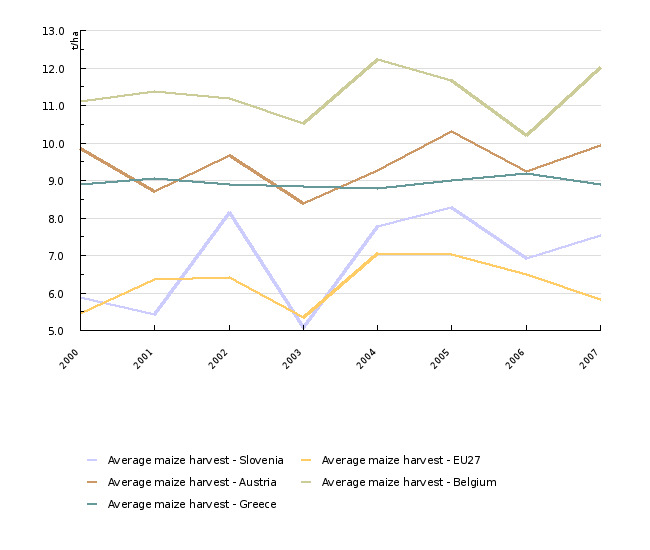 Survey of Agricultural Holdings, Slovenia 2000 (Results of Researches, 15, Agriculture and Fishing, No. 777). Ljubljana, Statistical Office of the Republic of Slovenia, 256 p.
Statistical Office of the Republic of Slovenia, 1997. Sample Farm Structure Survey, Rapid Reports, No. 298, Ljubljana, December 1997. Statistical Office of the Republic of Slovenia, 2004. 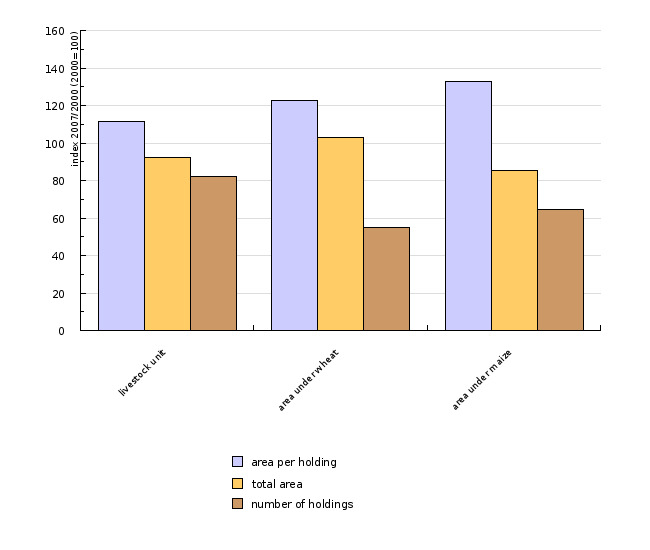 Structure of Agricultural Holdings, 1 June 2003, Rapid Reports, No. 13, Ljubljana, April 2004. The main sources of data used to calculate indicator values are the structural surveys of agriculture carried out by the Statistical Office of the Republic of Slovenia. As in other EU countries, these surveys are carried out every three years. Comparable data for 1997, 2000 and 2003 are available. In 2000, a complete survey of agriculture was carried out, and included more than 86,000 agricultural holdings. In 1997 and 2003, however, only sampling surveys were carried out. Eurostat, 2003. Agriculture. Statistical Yearbook. Brussels, Luxembourg, ESC-EC-EAEC.